So, what is the “ripple effect”? 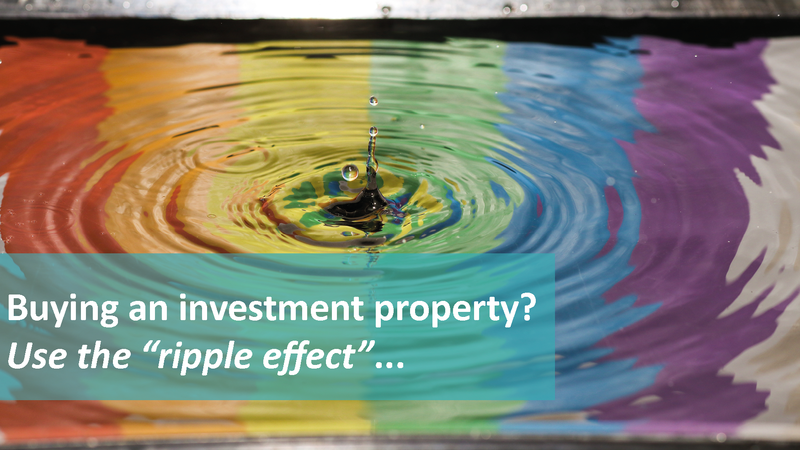 A common trend that occurs in hot property markets is the ‘ripple effect’, where buyer demand and capital growth ‘ripples’ outwards from one suburb to the next. Simply put, as prices increase beyond the reach of buyers in the suburb of their choice, they tend to look for ‘the next best thing’ that falls within their budget; in adjoining, lower priced suburbs. Then, as more and more buyers start buying in these adjoining suburbs, property prices start to rise. Fantastic! In what areas does the “ripple effect” tend to happen? This ‘ripple effect’ in capital growth typically moves from the inner suburbs outwards, and along or away from the coastline. For smart property investors, the trick is to pick these suburbs before the ripple of price growth hits, or before it has become too established a trend. This sounds easy, but it requires good timing and plenty of research. Measure property values based on median prices between adjoining suburbs. If there is more than 10% variation, chances are the suburb next door could play catch-up. You can also take a look at suburb profiles to get better informed on each of their different strengths. Closely monitor median price trends. Generally, at the start of a property cycle, the inner suburbs will be the first to show signs of growth, which will then ripple outwards. Once the cycle has kicked off, look for properties within your budget as close to the growth areas as possible. Think of rising interest rates, affordability and market confidence. These all affect the length and breadth of the property cycle. When price growth in the major Australian markets came to a halt at the end of 2003, the following two years saw the highest capital growth rates return to the inner city suburbs and the ripple of price growth didn’t make it to many of our outer, less affluent suburbs. Investors who were betting on the ‘next best’ outer ring suburb lost out when the growth ripple didn’t quite make it that far. Interestingly, the same thing happened when our property markets picked up in 2012; after their two year slump, post the Global Financial Crisis. Need an example? Let’s assume that the primary driver of the ‘ripple’ is thanks to a trendy suburb or fashionable dining or entertainment precinct. The reliability of capital growth in your “secondary suburb” will then be likely to decline in line with the distance traveled. In other words, proximity and convenience is key. A safe rule of thumb is: any more than a five to ten minute drive is too far! Other geographic barriers are main roads or highways – some of which have a sort of psychological effect. People don’t really want to live on the “other side.” Sometimes there is a perceived price differential between one region or another; or one street and another; or even one side of the street and the other; but it’s that way for a reason. Without intimate knowledge of a particular suburb, both interstate and local investors can get caught out buying a “perceived bargain”, only to find out that side of the street or that orientation will always be worth less than the other. The bottom line is – in this more mature stage of the property cycle, you need intimate knowledge of the suburb you’re planning to buy in. If you don’t – you might get caught out! Want some advice on your next investment property? Give Brendan a call on 0439 998 867. He’d love to guide you and lend his 12+ years of property expertise.